The windows waiting to be installed. The Motion Windows build quality is really good – quarter inch glass, factory tint, aluminum mesh screens, durable locking mechanism. I purchased two large windows for the sliding door and behind the driver’s seat, and two smaller windows for above the high rear bed. The aluminum screens are easily removed. The trim ring which clamps the window to the van sheet metal. I took some photos during the install process, and George was kind enough to let me help out along the way. So here's how it's done. And there’s another blog on this, as well as a video here. Jigsaw with a metal cutting 32 TPI blade. You could use a 24 TPI blade, but you’ll get less chatter on the sheet metal with a finer blade. Markel Paint Marker is quite a bit easier than a q-tip and bottle of paint, and you’ll use it elsewhere in your project. Make an accurate lightweight cardboard circle of the appropriate corner radius. Mine required 2 1/2” radius. Unscrew the trim ring from the window. Note the location of the screws, and how they fit into the channel of the window, as this is where you will be placing the final screws at the end of installation. Make a template of the opening by placing the window on top of a piece of cardboard. Trace around the part of the window that will go in through the hole in the side of the van. DO NOT trace around the outside of the entire window :). The red arrow points to this inner part of the window which you trace onto cardboard. Using your cardboard template, decide exactly where to place the windows. The transit has some areas allocated for windows, but there is some flexibility in placement of the Motion Windows within this space. For the larger window, you’re limited to a bit of movement left and right. For the smaller windows, there’s a lot more flexibility. The cut line cannot be too close to the panel braces or framing. Refer to the pics below for the closest you can get to the top and sides of the Transit window indents. In general, within 1” of the left/right bracing, and maybe 3/4” from the top bracing. Put down the cardboard template. It’s useless for actually doing the layout, as the bracing pushes it away from the sheet metal. Using a measuring tape, mark the left and right edges of the opening, and then mark the top and bottom edges. Add about 3/16” of space all around - so that after the window is placed in the hole you can make a small adjustment left/right/top/bottom to level it out. For example, if the window height is 23 7/8, the hole height should be 24 1/4. The top and bottom edges are parallel to each other. Use a square to square up the left/right lines and the top/bottom lines. Use a straight edge to make the long lines. Once you have the lines marked, use the radius template to make the curved corners. Measure everything again. Measure all of the lines again. Measure the windows again. Make sure all of your corners are square except on the forward edge of the big windows. Hold the cardboard template up to the window, and make sure it matches exactly. Now hold the cardboard template up to your markings on the van wall, and make sure they match. Once you are really 100% certain everything is laid out correctly, go inside and watch tv. Then go back out and measure again. You only have one shot at cutting giant holes in your van. This is the window behind the driver’s side. It’s placed as far forward as possible. The top, left, right, and bottom edges have been measured and marked. Now George is connecting the lines. Applying a radius to the corners using the radius template. 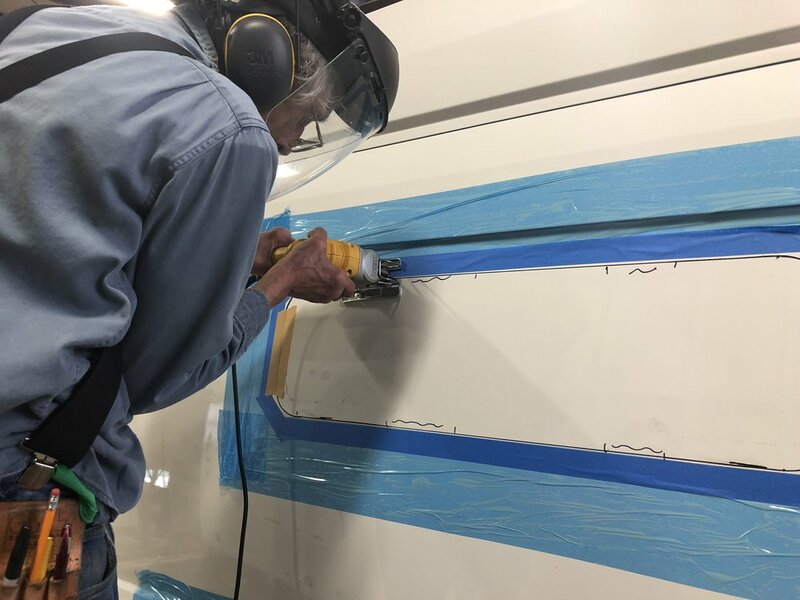 Note that for the rear window we are partially cutting into the brace, but the trim can slip underneath this after the bonding foam is scraped out. Marking where the internal bracing is locati. Area is fully masked off, including the sheet metal ridge below which can catch hot metal. Now it’s time to transfer your inside layout to the exterior. It’s too hard to cut the van wall accurately from the inside with all of the bracing in place. An old blanket taped along the top and bottom edges of the opening keeps the metal fragments out of the interior spaces where it’s impossible to remove later. Using your 3/32” drill bit, drill a total of 8 pilot holes for each window - 2 pilot holes at each corner. You’ll use these to draw both the straight lines and the curves on the exterior of the van. Try to catch the metal fragments with your hand, or run a shop vac while you’re drilling. Mask off the exterior to protect the finish from hot metal landing on it. Using the cardboard template, mark up where the interior bracing is location. You’ll need this when making your cuts to cut these areas before the end. Here’s where all of your triple measuring pays off. You are going to nonchalantly cut giant holes in your van. George cutting around. Note the markings indicating the interior bracing. Tape up a blanket inside the van around the window. The blanket will catch all the hot metal fragments. Using a grinder or drill, make a hole at the bottom left and right sides of each window opening, inside your line. You’ll use this to insert the jigsaw blade into to start your cut. If you’re using a grinder, consider your spark path, and maybe throw a towel over the rear view mirror. Start cutting along the line with the jigsaw. Go as slow as necessary to make a nice straight cut. Use a file to clean up the rough edges of the cut and knock down any jaggies from the pilot holes. Congratulations! You now have giant holes in your van! The slider door lock will bump into the window. You’ll need to cut off about 1”. I used a pair of wire cutters, but an angle grinder might be cleaner. 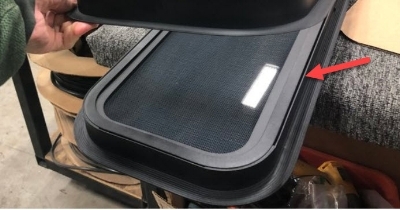 Insert the trim ring on the interior of the vehicle around the opening. It’s easiest if you insert the top part of the trim ring underneath the cut off framing members, and then finish with the bottom side. Open the sliding glass portion of the window, this makes it easier to handle the window. Insert the window into the opening and verify that it’s a close fit all the way around. With the window lying outside down on a soft surface, clean the window flange with some lacquer thinner. Then apply the seal tape on the flange starting at the middle of the bottom of the window, going all the way around, and overlapping the two ends by approximately ½ inch. Pull the backing from the tape as you progress to make the transition around the corners easier. Use a spray water bottle and mist the perimeter of the opening on the outside of the vehicle. This prevents the tape from sticking to the outside wall before you’re satisfied with the final position of your new window. The final installation of the window is easier if you have someone helping you. 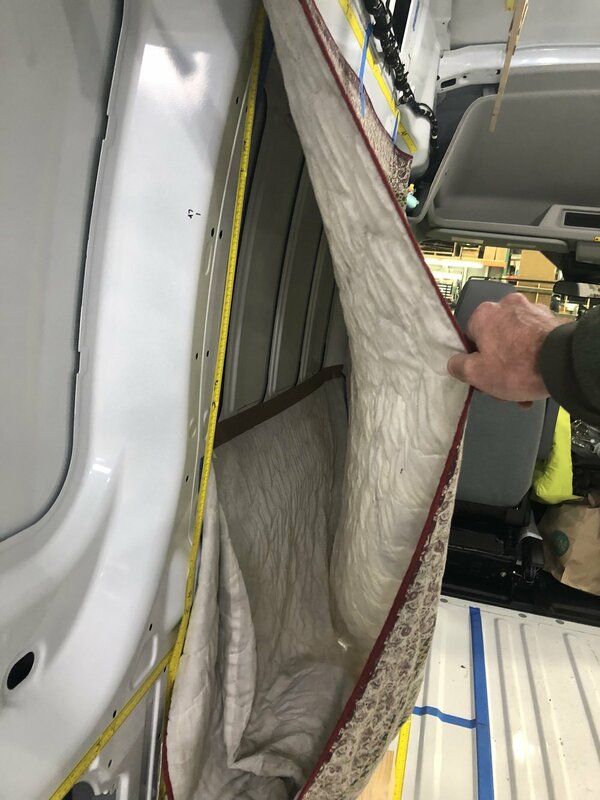 Place the window with the foam tape into the opening and make sure it is parallel to the van sheet-metal indentation along the top edge. This is the most noticeable joint where an offkilter placement would be obvious. The person on the outside holds the window in place, pressing it against the side of the vehicle, while the person on the inside screws the trim ring into the window frame. Even after the trim ring is partially screwed down you can still tweak the window location if it shifted. Motion Windows says that no additional sealant is needed, so I didn’t apply any. Seems like caulk would end up peeling and looking ugly after a few years.